Rhubarb is one of the first vegetables gardeners can harvest in the spring. It is a perennial plant, so it comes up on its own each spring, sporting beautiful red stalks (or sometimes pink or green) which can be turned into a number of delightful treats. Somehow it was always elderly people in my life who had large rhubarb patches from which they were happy to share. I guess that makes me think of rhubarb as an old-fashioned food, but one I love. As a child, my mom would give us kids a bowl of sugar and a few stalks of rhubarb. We'd dip the end of our stalk in the sugar and then take a bite. I think my all-time favorite use for rhubarb is strawberry-rhubarb pie. While in the UK I was introduced to exclusively rhubarb pie, which I enjoyed and made several times. 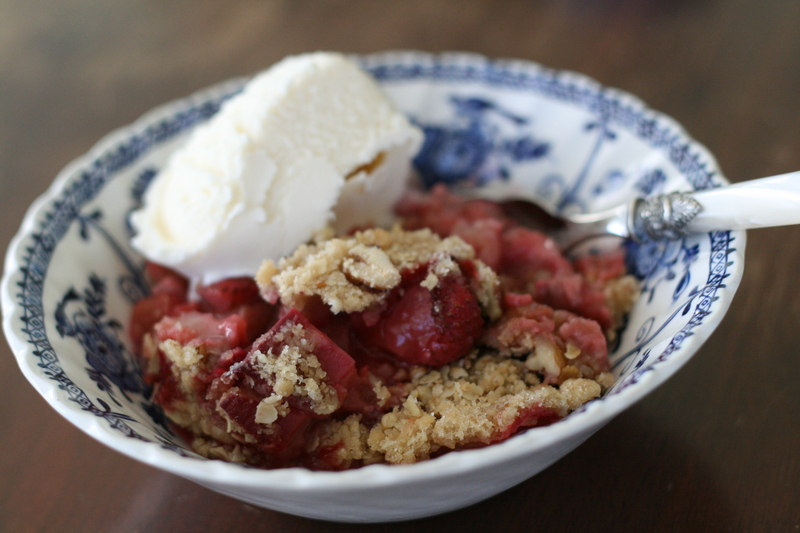 Rhubarb is delicious in a crumble (see recipe below), either on its own, or combined with strawberries. And it is well-suited for jams and chutneys. Stewed or roasted rhubarb with whipped cream is a simple but sublime dessert. I even came across a recipe for using rhubarb in a green salad! Preheat oven to 375F. Butter 11x7x2-inch glass baking dish. Place 1/2 cup sugar in a large bowl. Scrape in seeds from vanilla bean; whisk to blend well. Add strawberries and rhubarb to sugar in bowl; toss to coat well. Scrape fruit filling into prepared baking dish. Sprinkle oat topping evenly over filling. Thanks for posting this, Heather. One of my friends just gave us a bunch of rhubarb and a super easy, yummy recipe for a rhubarb crumble if you're in a pinch. It's probably not as good as fresh strawberries, but it gives the sweet/sour flavor.